I'm helping represent Textures Music Group, otherwise known as TMG, which was created solely for the purpose of recreating the lost auras of what drum and bass used to be and where it is today! Some would call it a happy medium -- we call it innovative again! TMG releases have been featured on broadcast FM, internet radio shows, DJ mixes from people like Nookie, LTJ Bukem, Stunna, Tidal, Kasio, ATP and a host of others worldwide, stateside DJ tours, enthusiast magazines, production competitions, start up record labels and so on! The seed was planted many years ago and has grown into a collective of DJ's, producers and world wide audiences! We're definitely looking forward and it's bright out! Check us out at www.texturesmusicgroup.com if you'd like to get in touch! 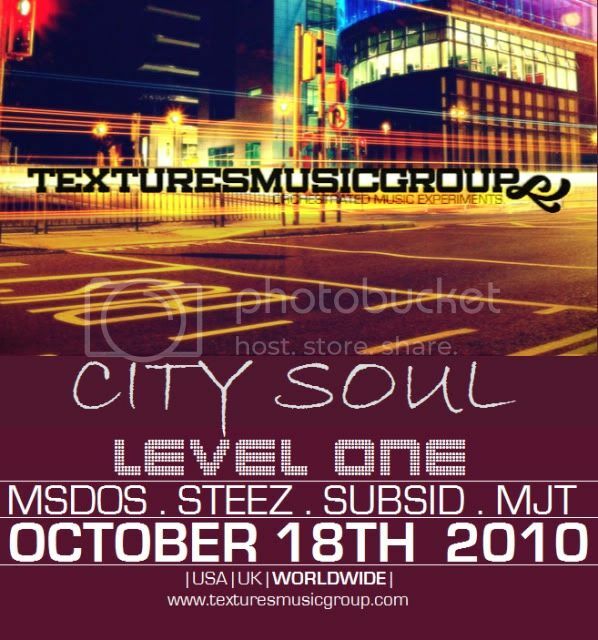 Also we have an exclusive 2010 Promo Mix by Melos on www.soundcloud.com/texturesmusic where you can download it for free. Look out for new music from B4ssTee, mSdoS, Steez, Aquasion, Aqueous, Melos, ATP, Subsid, MJT, Nusense and company. Publicado: Mar Jun 08, 2010 7:20 pm Título del mensaje: B4ssTee - "Urban Love EP" [TMGRLS4] - June 15th! 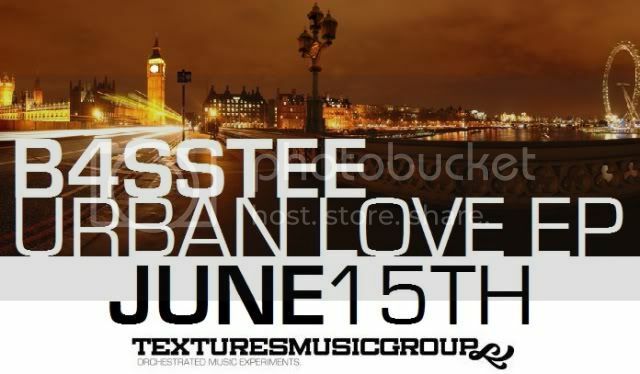 Textures Music Group steps up with release number 4 - B4ssTee - "Urban Love EP", a jazz infused soulful journey into B4ssTee's trademark sound which has picked up support recently from Stunna, Komatic and many more! TMG are set and ready for the rest of 2010 with some wicked music lined up - think seriously deep soulful jazzy mystical grooves! Available at all good online stores June 15th 2010! or at juno download, chemical records, dj download, mixmag and discogs digital! Input + For The Soul! The Secret Self EP is the debut for a new addition to the TMG family and expect nothing but the finest in deep jazzy drum & bass from Melos with his track 'Input'. Filtered pianos and guitars help to build this deep roller complete with clean organic beats and growling bass hits & sub. ATP delivers the good with his soundtrack for the summer 'For The Soul'. A beautifully crafted piece of music, this one takes the listener into a sub-tropical state of haunting pads, chimes and bells before soothing the soul with subtle vocals, deep bass and crisp drums. Available July 15th at Juno Download, DJ Download, Chemical Records, Mixmag Download and other good online stores! Our next release 'Precision EP' (TMGRLS6) is out now in all good online stores including Juno Download, DJ Download, Mixmag, Chemical Records and more! With DJ support already from LTJ Bukem, PMX, Melos, Static and Deeper Connection you need this release in your box asap! Reminiscent of a middle eastern escapade with a dash of beautiful vocals, relaxed sitars and trumpets this track is definitely 'So Right'! A step up from the original, Aquasion takes you on a smoothed out ride through this chilled out rework of the original by the renowned German producer Steez! By the time you're done listening, you'll have already been around the world once or twice! A classy rework of the original, Aquasion comes correct on the remix duties with lush pads for the summer time that will chill you out! Rolling vintage breaks, deep punchy bass lines, delayed keys and nostalgic trumpets make this very minimal jazzy roller a nice treat! Expect guest mixes from some great artists, interviews, remix competitions, reviews, top tens and more! Textures Music Group are very proud to present their latest release! After lots of hard work from the label and the artists on October 18th we bring you a new series entitled 'City Soul' starting with Level One. A jazzy ensemble of crisp break beats, heavy bass lines and vintage rhodes. Nostalgic of a long taxi ride, crowded city streets or a busy cafe late into the night 'City Lights' comes correct with it's contemporary take on jazzy drum and bass! An energetic masterpiece! From it's lush rhodes and futuristic FX to the deep bass line and soulful female vocals this one is a keeper for the aspiring DJ! A clean, crisp and classic sounding tune. Truly a masterpiece! Things get rolling quickly as the pads glide effortlessly across the entire track. Abstract male vocals weave in and out of the breaks while the vibrant trumpet playing not only adds character to this amazing track it solidifies what Textures Music Group is all about musically! This is a must have for anyone who misses the more jazzier side of drum and bass! A deep and heavy track that will mix up any party and get things in full swing. Rhodes, pads, saxophones, bass and break beats all mix together to create a delectable sound and style that will suit the most exquisite taste in deeper drum and bass today. Supported by Nookie and many others you can't afford to not have this track in your collection!